Za'atar refers to a blend of Middle Eastern spices that bring out some unique flavors and textures. For instance, the blend usually contains sumac, which is a strong acidic spice that packs a punch to the taste buds. It is also the very element that will keep you eating more! There are also some herbs such as fresh thyme. To add a little crunch, there are also white sesame seeds found in this blend. This is why it makes the perfect mixture as a seasoning or dip! Here we make our very own pita chips. 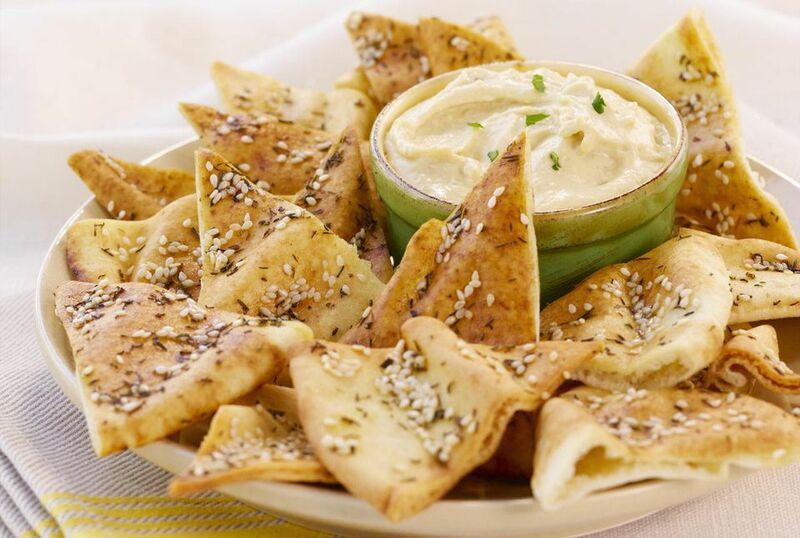 Pita chips are so easy to prepare and can make a healthy snack, too. Delicious on their own, za'atar pita chips is especially good with Middle Eastern dips like muhammara or hummus. There are no set measurements for the olive oil or za'atar, so you can vary the chips to taste. The great thing about these three ingredients is that if you don't have the time to bake the pita bread into chips you can eat these as a dip. Simply have a small dipping bowl or dipping plate of olive oil and another dipping plate for za'atar. Then simply cut the pita bread into slices, dip first in the olive oil and then into the za'atar mixture and enjoy! Although, if you have the time to make the chips, we highly recommend you do so! Preheat the oven to 375 F. Line one large or two medium baking sheets with foil. Spread the pita triangles, inside (textured side) up, in a single layer on the baking sheet(s). Drizzle or brush the pita triangles lightly with the olive oil. Sprinkle liberally with the za'atar. Remove the baking sheets from the oven and place on racks to cool. (The chips will get crunchier as they cool). Serve warm or at room temperature with dips or soft cheeses. Chips may be stored in an airtight container at room temperature for 2 to 3 days.